Best Tennis Score is your portable umpire, designed from the ground up for Apple Watch. 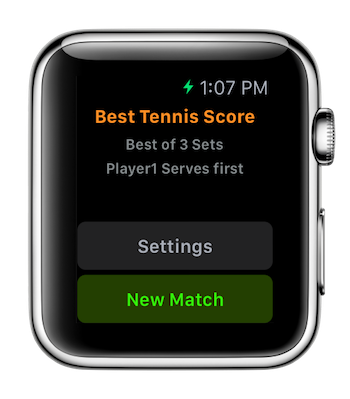 Best Tennis Score is the easiest way to keep track of your tennis score using Apple Watch(TM), allowing you to focus purely on your game. Ideal for beginners learning to score and more serious players alike. With big, hard to miss buttons we think Best Tennis Score will make scoring a breeze. This means you can focus on the game rather than remembering the score after that long rally. Designed to be used on Apple Watch(TM), you just need to ensure your iPhone(R) is within bluetooth range (on the court) and Apple Watch(TM) becomes your wearable umpire. Ideal for beginners especially as it will help you as you learn the scoring of the game by doing it for you. Best Tennis Score was written for those who struggle to keep score and want to just focus on the game without having to think too much. It will help you avoid any unnecessary disputes with unscrupulous opponents. We will be adding more features in coming months, so please do let us know which ones you would find most useful and we'll try and add them in for you. If you are a tennis enthusiast, please email support@pyrotechnic-apps.com to send your suggestions.